Walker County boasts a labor force of 30,209. Nearly 39% of local jobs are in the service sector, while manufacturing accounts for 33% of all private employment positions.​ Roper Corporation, Shaw Industries Group and Nissin Brake Georgia are among Walker County’s top employers. The Walker County Development Authority, an entity independent of Walker County Government, assists in the marketing and development of various properties within the county. For details on a specific property, contact our Economic & Community Development Director, Robert Wardlaw, at 706-996-7971. Some of our most in demand locations include the former Coats American Building, the former Barwick Archer Building, the Northwest Georgia Business & Industrial Park, Walker County Business Park, and the Crutchfield Property. 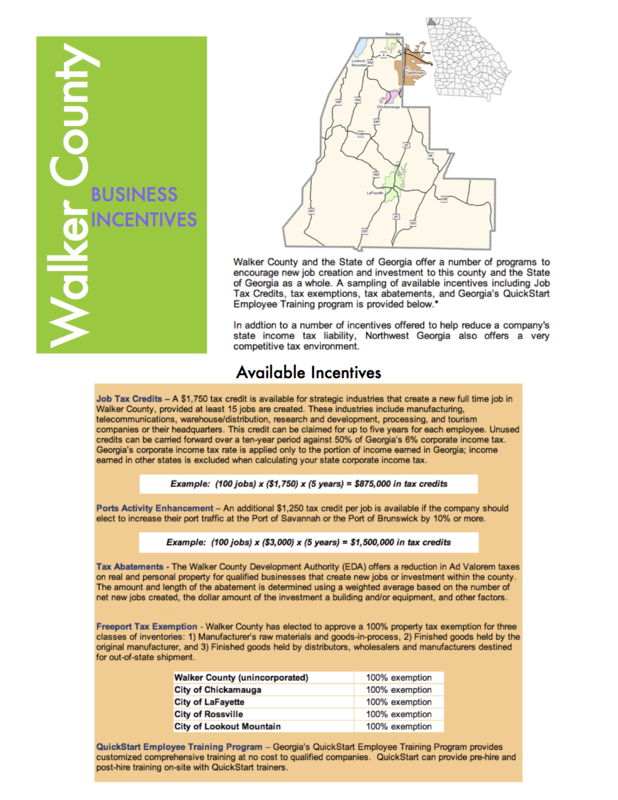 Walker County’s industrial parks are equipped with fiber technology that allow for unlimited data processing capacity. These are some of the first “smart parks” in the State of Georgia. Walker County is also home to the best welding school in the nation. Skills USA consistently ranks Georgia Northwestern Technical College at the top college in the nation for this trade. Watch this feature on GNTC from NBC affiliate WRCB-TV. Interactive site map of available properties.